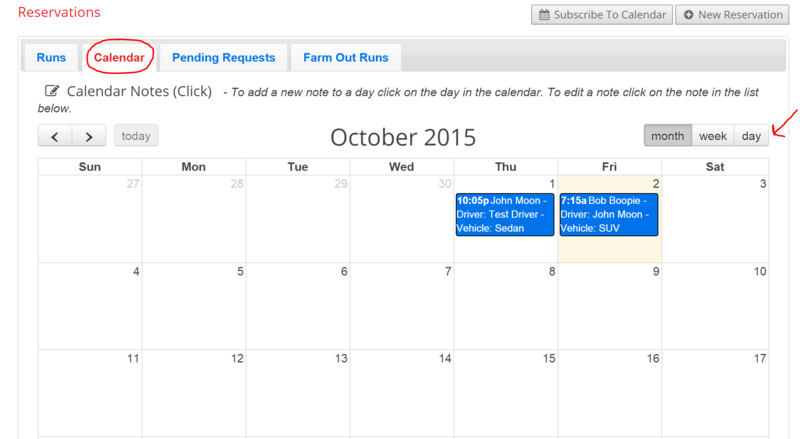 Book Rides Online allows you to view your reservations in a list format and in a calendar format. To view your current and upcoming reservations, first go to the “Reservations” page. This is what we refer to as your “main reservation page”. When you open this page, you’ll see the reservations in their list format. Anytime you want to see the reservations listed this way, click the “Runs” tab under the “Reservations” page. You can see the tab circled in red above. 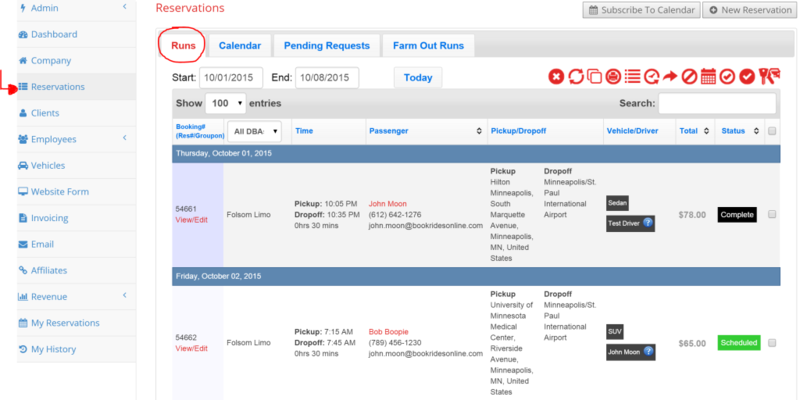 By default, your reservations will be shown a week at a time in the list format. They will be separated by day. 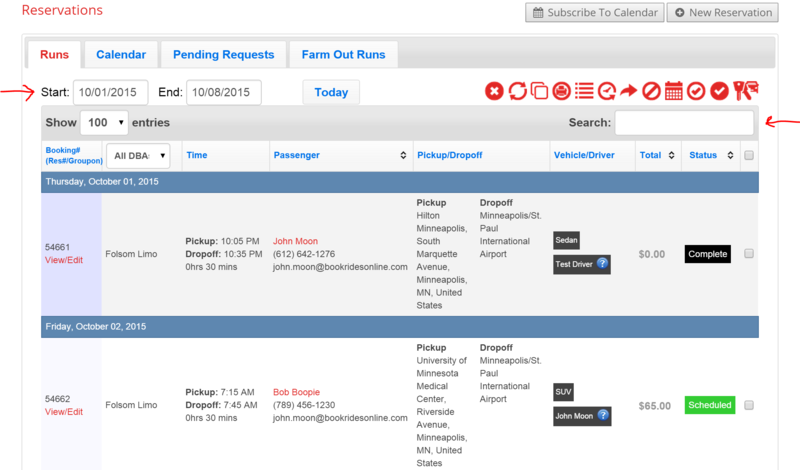 You can change the dates above the reservations to extend or simplify the dates you want to see. If you’d prefer to change the default amount of days shown at a time (default is one week), you can see our tutorial on Reservation Page Defaults. At any time, you can click the link on the left of a reservation marked “View/Edit” to open up the details of that reservation. You can also search through the reservations at any time within the dates you’ve set using the search bar shown above. You can search for reservation number, client name, driver name and vehicle assigned. If you have multiple DBA’s, you can also specify if you’re wishing to view just one DBA at a time or all of them by using the drop down menu above the DBA’s listed. If you prefer to view your reservations in a calendar format (this can be helpful for reservations that start on one date and end on another), simply go to the “Reservation” page, but choose the tab marked “Calendar”. Here you have the option to view your reservations by month, week or day. At any point, you can click on a reservation to open up the details of that reservation.